What is more exciting than fashion? Just one thing: When fashion meets art! 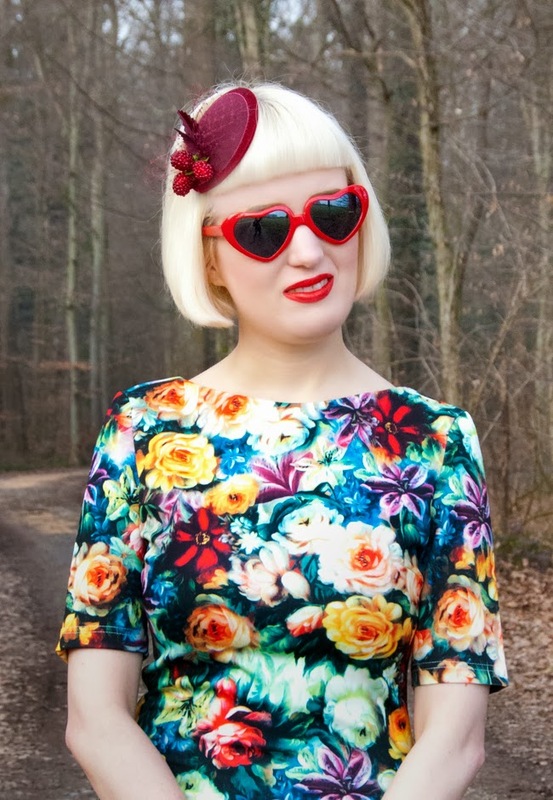 Today I want to take you with me to the odd and bizarre world of Anne-Sophie Cochevelou. This woman crosses these borders with an extraordinary virtuosity and is not afraid to experiment at all. 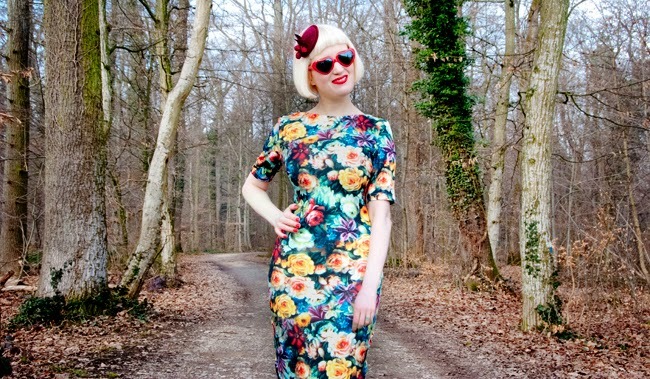 Anne-Sophie is a young designer of fashion costume and jewellery from Paris. She graduated at Central Saint Martins London with a MA in Performance Practice and Design. Her work is full of various cultural references. 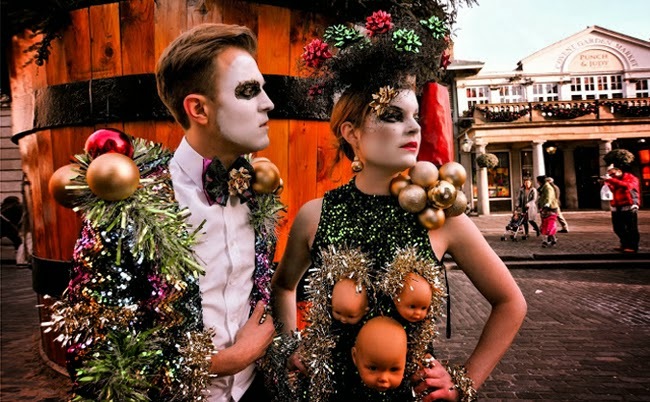 It's not about trends at all, but a mixture of fashion and performance art. The toys of her childhood are Anne-Sophie's biggest inspiration and especially dolls are omnipresent in her work. She says that since she is too old to play with them, she discovered to wear them as a piece of art and wear them out. 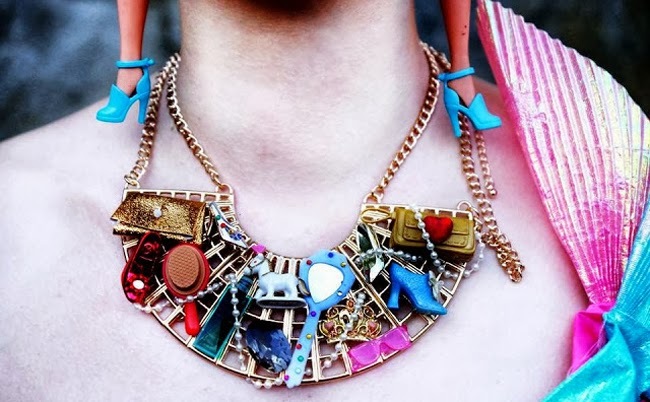 Anne-Sophie is a master of creating the most extraordinary looks from found, used and unwanted materials. Dresses don't need to be made out of fabric in Anne-Sophies creative world, but everything can be worn. When I found Anne-Sophie's blog, I immediately felt a strong connection between her and me, even if what I wear is so much more commercial than her work. Is her work fashion or anti-fashion? I don't care, it's wonderful in it's colourful vibrancy and it makes me dream. Anne-Sophie Cochevelou, Sara is in Love with you and hopes to see in a doll dress on the streets of London one day! 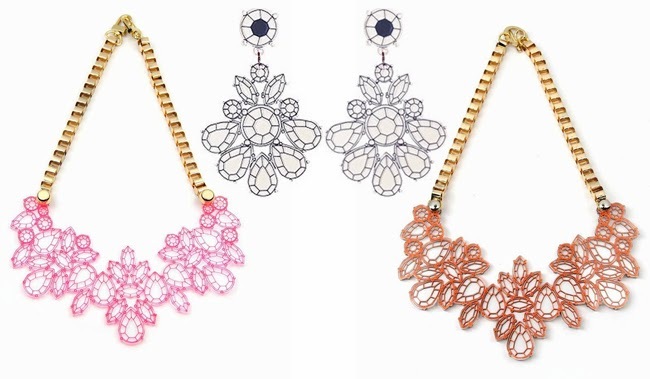 Please visit Anne-Sophie Cochevelou's blog and shop her jewellery here. 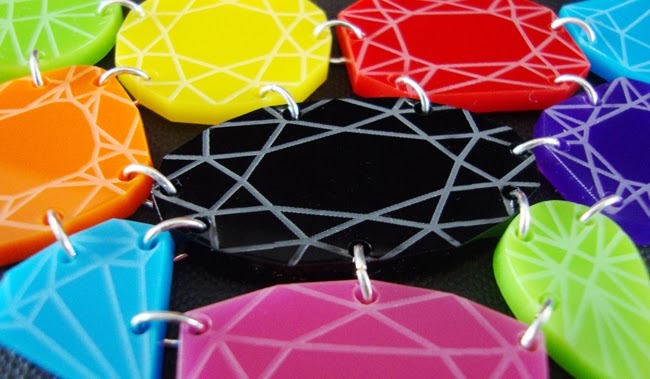 While thinking about delicate jewellery, perspex is certainly not the material mentioned first. But Kanokkorn Lamlert, a Bangkok (Thailand) based artist and jewellery designer proves the opposite. Unlike most acrylic accessories, her work shows an extraordinary love for details and a graceful daintiness. 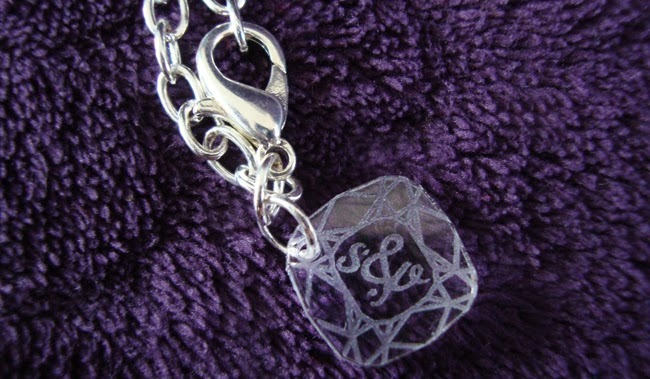 All her jewellery is extremely refined and hand made. The pieces of jewellery resemble opulent candelabrums and the diamond shaped pieces make the heart of a girl beat as much as real diamonds. 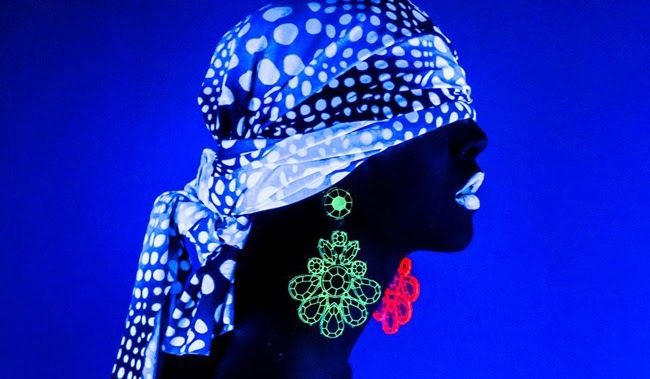 There are versions of the earrings that even glow in the dark for perfect party looks. Because perspex is a very light material, despite their big size, you can wear them for dancing all night. You can buy Kanokkorn's jwellery at Guruwan or email her directly at kanokkornlamlert@hotmail.com. Please follow this amazing designer on Facebook as well to keep an eye on her further work. Hey darling, this is my Valentine's Day look. Hearts and flowers, the best choice for the day of love! Who could ever resist those berries? They look almost better than real berries, I swear. Aren't they pretty and like from a baroque painting? Love is in the air! The couple in the background is already holding hands, who takes mine? Heart shaped glasses express the love I feel. 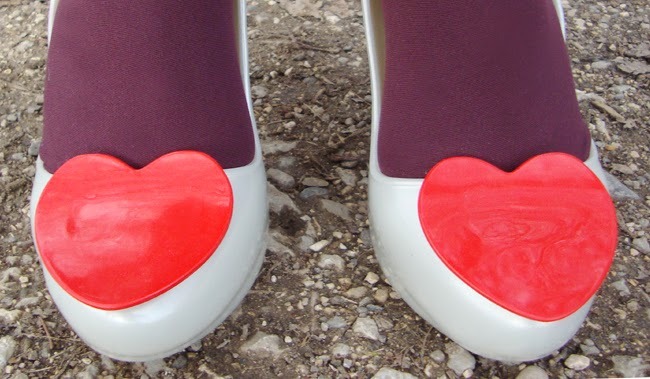 And the perfect Valentine's Day shoes can't be missed. My love for Melissa is eternal for sure. Finally the time has come to reveal my look for Valentine's Day! This year I was excited about this day and my look like never before. I already planed my outfit weeks ago and couldn't barely wait to go out with it. The obvious choice for a Valentine's Day look would be to wear all red or pink, but this year I had something a little bit different in mind: An outfit like a baroque still life with flowers and berries. Not as a symbol of the evanescence of my love, like what the painters expressed with their work during the period of Baroque, but as a lush sign of joy. 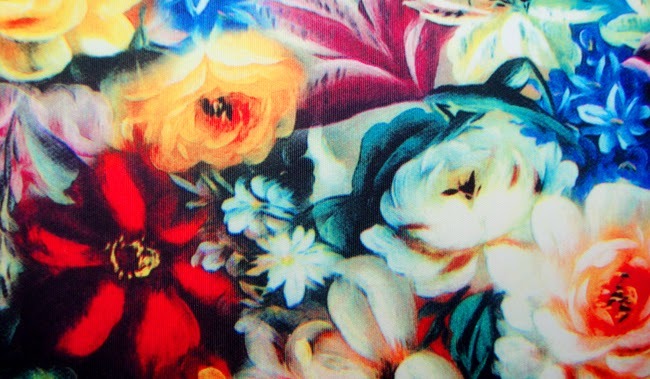 Therefore no broken glasses, no skulls and no insects hidden behind the flowers, just petals in vibrant colours. Yes to lavishness, yes to love! I was a little bit worried if the dress would fit my curvy body, but when it arrived I was surprised that it even flattered my shape in a way not many dresses do. 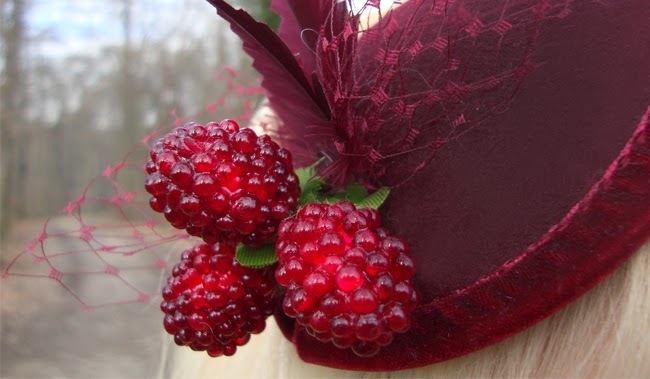 The cute berry fascinator is from Jazzafine's "My Funny Valentine Collection". The berries are very tempting to take a bite, because they look almost better than real. I think this little hat will find it's way into my everyday accessories. We went for dinner at our favourite Indian restaurant to celebrate. What a good start for the weekend! My darling loved my outfit very much, especially the flower dress. Now I'm curious to hear your opinion my lovelies! How did you spend your Valentine's Day and what did you wear? Girls love diamonds, so they shall have some! Gems in all the colours of the rainbow can be yours. Isn't this a true eye-catcher for your neck? 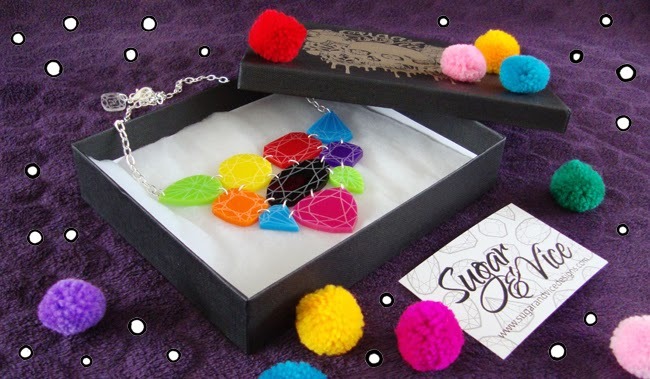 Just enter to make this lovely Sugar & Vice gem yours! Finally, after a time that seems far too long, it's time for another giveaway! When I saw this gemstone necklace from Sugar & Vice, I knew immediately that is is the perfect piece. Since my blog is a colourful world, I am very eager to give something bright and vibrant to one of my lovely readers. Those who follow my blog for a while, might already know Sugar & Vice. I love the quirky and cute pieces of the British label. Their gemstone necklace is already a classic and I think one of their most remarkable pieces. Recently they made more amazing gemstone creations and now they have a whole collection. One of the iconic necklaces can be yours very soon, see below how to get involved. Good luck to all of you my lovelies! The giveaway is open worldwide. It closes at the 26th February midnight CET. - You have to follow "Sara is in Love with:" on GFC, or Bloglovin. Not all mouses are the same: Some like cheese, others are crazy for pompoms. Material mix: Fluffy little jacket meets shiny vinyl skirt. Thinking about other things I could make prettier with pompoms, but my little jacket. No Minnie Mouse look without a bow of course. This time on the arm instead of on the head. Still crazy for those jelly shoes. 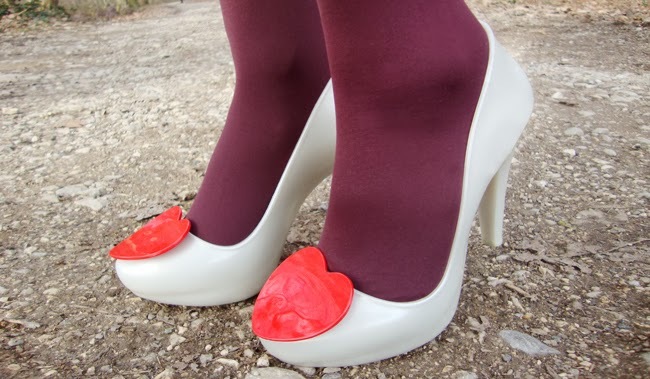 I think they are among the best designs Vivienne Westwood made for Melissa. Yes, I am crazy for pompoms and there is no end in sight! What polka dots are for Yayoi Kusama, pompoms are for me. Measles? Chickenpox? Forget about these and pompom the world with me! 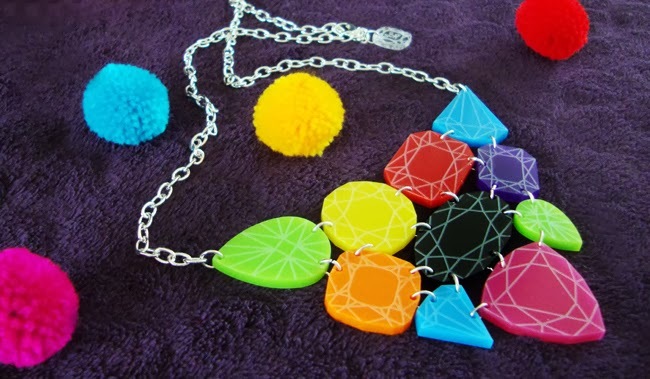 I bought two big packs of pretty colourful pompoms a few weeks ago and now I can't stop thinking about where to apply them. Why not everywhere? 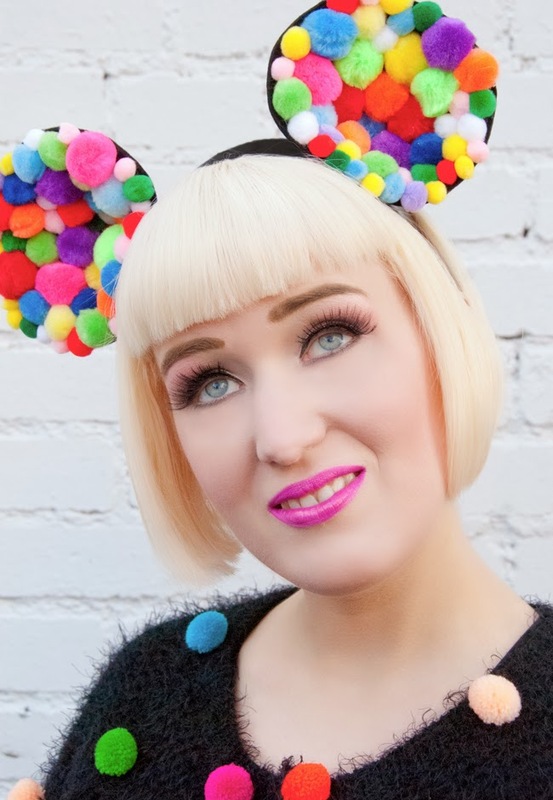 Pompoms on my shoes, pompoms in my hair, on my furniture and on the walls… Beware, I don't know limits! As a little start, I customized this black and a little bit boring little jacket and turned it into something after my taste. I think there must be a strong and wonderful brain connection between me and my favourite milliner Pearls & Swine: A few days after I finished my jacket, a parcel with this super cute headband arrived in my letterbox. A surprise to make my heart pompom! 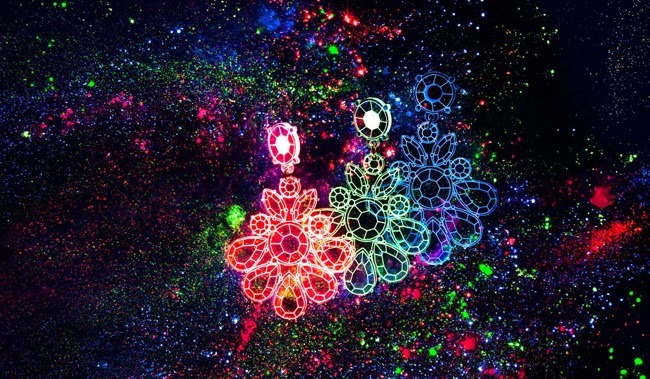 Imagine a city with cute little pompoms in all rainbow colours everywhere. I remember seeing a documentary about the Austrian artist Friedensreich Hundertwasser. He said that everybody should have the right to take a bucket of paint and colour the house he's living in as far as his arm can reach from the window. Isn't this a pretty vision of a city of colour and self expression? Instead of paint, I imagine pompoms on all the houses. 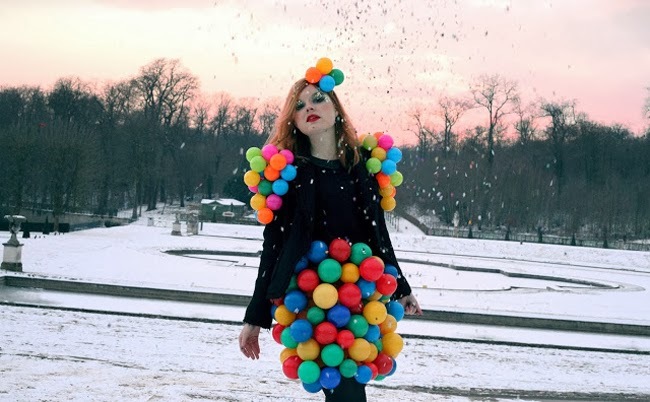 I am off for the moment, looking for other places to put my pompoms… I'm curious to hear what you think about this look meanwhile. Thanks to Pearls & Swine for the wonderful headband. It doesn't happen very often that hair products create a big hype. Bleach London made this come true when they realized their range of hair products, inducing 12 colour creams in exciting shades. 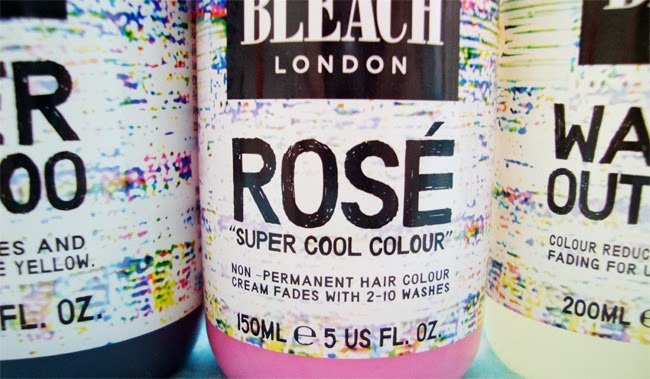 Bleach is a London based hair saloon and the place to go for hair in all the colours of the rainbow. This is a super cool colour indeed, no exaggeration! 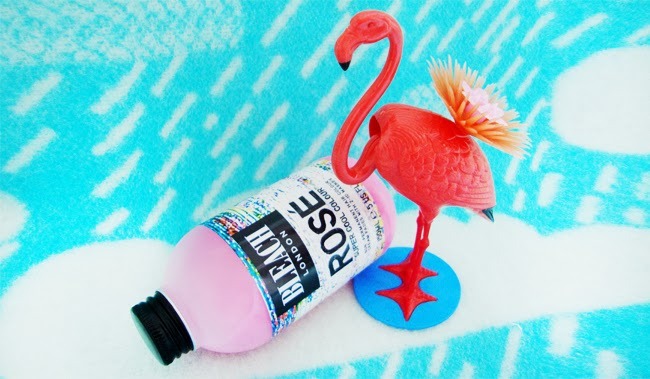 Most important: It doesn't have a yellowish shade, what I experienced on my hair with other pastel pink dyes. It's very easy to use – almost like a conditioner – and it doesn't drip. I needed a little bitt less than half of the bottle for my chin length hair and was surprised that it just takes 15 minutes to have my hair dyed. The colour is non permanent (unless for example Directions, which are semi permanent) and washes out very fast. When I washed it out after applying it, I already had the feeling that a lot of colour was running down the sink. My hair was a pretty vibrant pastel pink. After washing my hair again the colour already faded to a pale candy floss pink. Washing my hair every day, I was back to completely blonde within a week. Don't want brassy and yellow tones in your hair? Then this is your product! I love silver shampoos and this is a very good choice. My hair really looks more ashy after using it. I think if you leave it on for too long, you might get purple hair. Using dry shampoo is a good way to keep your hair colourful for a little longer. I don't think this one does a better job than other dry shampoo, but I dislike most of them because of their awful smell, while this one has a very lovely scent. This makes it a winner and I will buy it again! This product was actually one I was very eager to try, because I always wished to have something that speeds up the fading process. Sadly it is the only Bleach product which disappointed me. I couldn't see an effect at all. I still have two bottles and might use it again just to get rid of it. I wholly recommend you all products from Bleach expect the Washing Out Liquid. I have to mention that everything from Bleach smells just divine and I love the packaging. I definitely would like to try more products and I have my eyes especially on the colours Parma Violets, Blullini and Washed Up Mermaid. All products from Bleach are under 10£ and available at Boots or directly on their homepage. 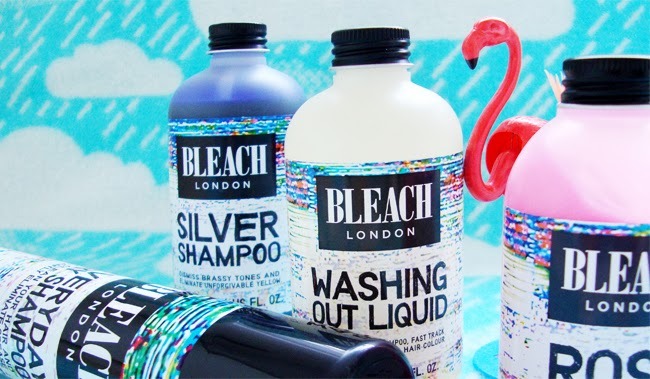 Did you already try products from Bleach London or would you like to?